This interesting name is a double diminutive form of the personal name 'hugh', derived from 'hugh-el-ot', the last two elements being typical medieval diminutive endings. 'Hugh' was introduced into Britian by the Normans in the form of 'Hugo', derived from the Olde German 'hug' meaning 'heart', 'mind', or 'spirit', and was recorded in the Domesday Book of 1086 as 'Hugo', in Huntingdonshire and in Suffolk. The name Hugh and its variant forms gained in popularity after the 14th Century due to the fame of St. Hugh, Bishop of Lincoln. 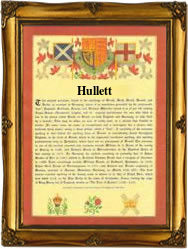 The surname development has included Richard Hulot (1275, Suffolk), Walter Howlot (1310, Devonshire) and John Huelot (1327, Worcestershire). Daniell, son of Thomas Hewlett, was christened at St. James's, Clerkenwell, London in 1692. The first recorded spelling of the family name is shown to be that of Agnes Hughelot, which was dated circa 1248, in the Records of Bec Abbey, Norfolk, during the reign of King Henry 111, known as the Frenchman, 1216 - 1272. Surnames became necessary when governments introduced personal taxation. In England this was known as Poll Tax. Throughout the centuries, surnames in every country have continued to "develop" often leading to astonishing variants of the original spelling.